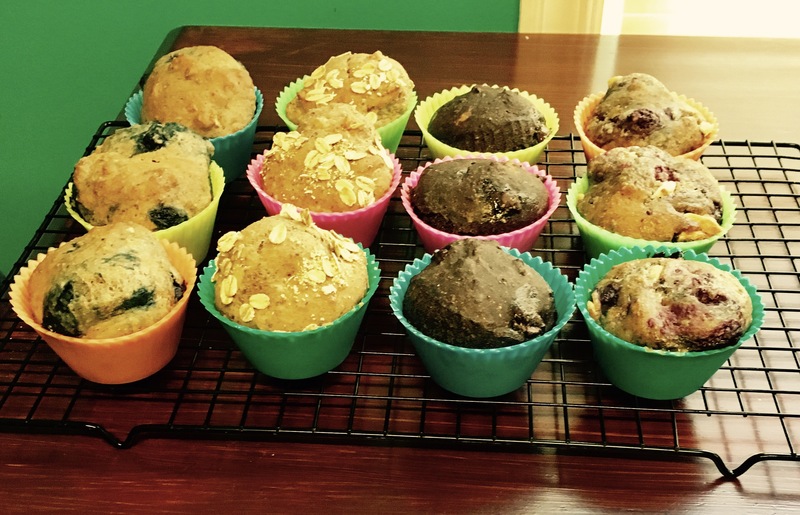 A little about me… I love muffins. They fall in the category of breakfast and dessert at the same time which is obviously why I like them so much. Something else about me, I can be indecisive when baking because EVERYTHING sounds good to me and I only have so much money I can spend on ingredients. Really it’s quite the dilemma. If anyone wants to pay me to bake for them and allow me to keep a few of the goods please raise your hand! So when I decide to make a muffin it goes something like this. Google search muffin ideas or Pinterest. Then I think “mmm chocolate sounds good. Wait, is that pumpkin?? Blueberry! What a classic! Banana nut and carrot cake, give them to me! Oh beautiful chocolate! I’m drooling. ” Get it? I want all the flavors. I have solved my problem though and maybe your problem too. I found a base muffin recipe that you can add whatever add ins you want. On this day, I divided the batter in half and made two different flavors. The original for this recipe comes from https://sallysbakingaddiction.com/2017/04/19/master-muffin-recipe/. She has some great stuff! I wanted though to make a recipe using some healthy food swaps to make a muffin you can actually call healthy. Because let’s face it, most muffins we eat are actually cupcakes without the frosting that make us feel like we are eating healthy. This base muffin has less than 100 calories. Most muffins clock in at 200 plus calories! 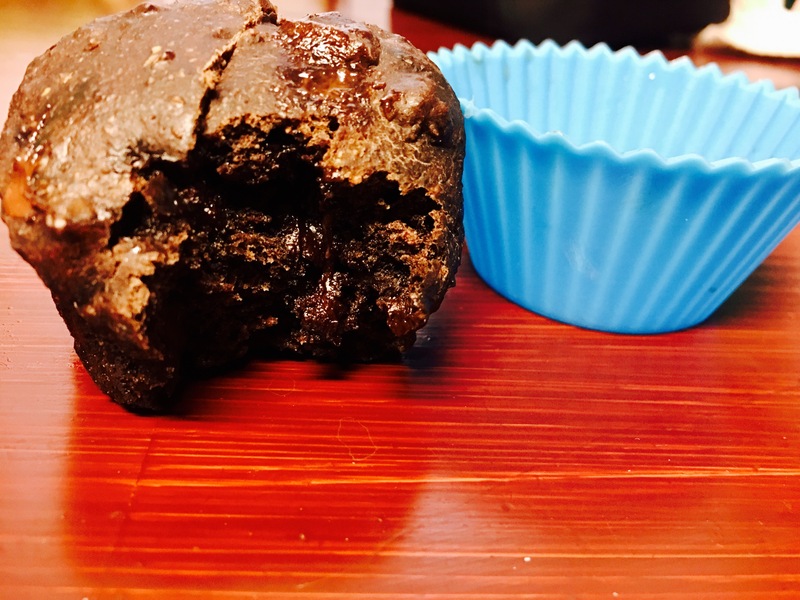 These two recipes I’m going to share with you are my families favorite so far using this healthy base muffin. White chocolate raspberry and chocolate chocolate muffins! Are you intrigued yet?? Substitute about half the all purpose flour with whole wheat flour. Substitute the sour cream with plain Greek yogurt. Reduce the brown sugar from 3/4 cup to 1/4 cup and add 1 tbsp maple syrup. Another swap you could make is using unsweetened almond milk in place of cow’s milk. I used non fat milk which is a good option too. To make the white chocolate raspberry muffins add 1/2 cup white chocolate chips or chunks and 1/2-1 cup frozen raspberries. Fold them into the batter last minute. To make the chocolate chocolate muffins add 1-2 tbsp unsweetened dark chocolate cocoa powder and 1/2-1 cup dark chocolate chips. I used Ghirardelli 60% dark chocolate morsels. I like them because they are bigger than regular chips. Add the cocoa powder to the dry ingredients and fold the chips in last minute. Are these not so delicious looking?? Something extra I did (because I cut the calories on these so much) was spread a little cookie butter on the top. Peanut butter would also be amazing! These muffins can be stored in the fridge for up to one week. They taste great cold or reheated in the microwave for about 20 seconds. I am really enjoying these as a sweet evening snack for less than 150 calories. I bake them on the weekend and they are ready to go for week for breakfast, snack, or dessert! Preheat oven to 425 F. Spray muffin tin with non stick spray, line with muffin liners, or line with silicone liners and spray with non stick spray. In another bowl combine butter, brown sugar, flax eggs, yogurt, and vanilla extract using a handheld mixer or paddle attachment of a stand mixer. Slowly add the flour mixture to the wet ingredients until almost combined and then add the milk. Continue mixing till mixture is well combined. Use a spatula to fold in any add ins. Spoon the batter evenly into each muffin cup. I like to use what I call a mashed potato scoop to make sure they’re even. Bake for 5 minutes at 425 F then reduce heat to 350 F and bake for approximately 15 more minutes. Allow muffins to cool slightly, about 5 minutes before removing from tin and allowing to cook completely on a wire rack. There you go! 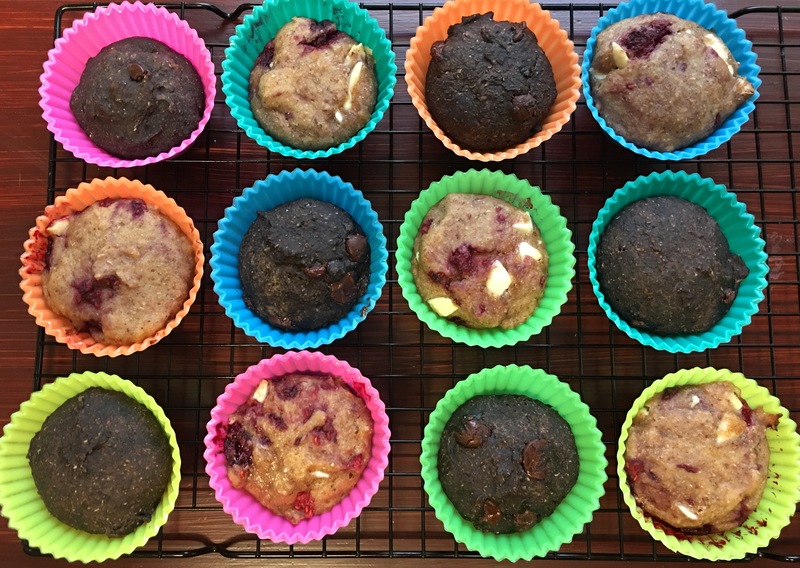 Please let me know what you think and what flavor combinations you choose to try in this base healthy muffin recipe! Two other combos I have made are blueberry almond and banana nut carrot muffin.